Fixing mobile devices in minutes and maintaining them through time-saving remote access has positive effects on businesses on all levels. It not only keeps mobile devices to function smoothly throughout the day thus keeping their users happy, but it also solves the ever-growing need for quick on-demand remote support for smartphones and tablets critical for BYOD based businesses. ISL Online’s latest remote desktop app for Android lets you securely access Android phones and tablets and fully control any Samsung device running on Android 4.2.2 or newer, while it also enables you to support any other Android device through screenshots and control remote computers from anywhere. – Connect to Android devices from desktop computers (Windows, Mac, Linux). – Connect to Android devices from Android phones and tablets. – Connect to Android devices from your iPhone, iPad and iPod touch. – Connect to computers (Windows, Mac, Linux) from Android phones and tablets. – Remotely control any Samsung mobile device. – Support any other Android device through screenshots. – Control remote computers on-the-go. ISL Light lets you easily connect to any Android device and remotely control any Samsung device running on Android 4.2.2 or newer, as well as control rooted Android devices if access to ISL Light is granted to the device’s super-user when prompted. Tech support centres can thus easily provide wicked-fast remote support for just about any Android device. 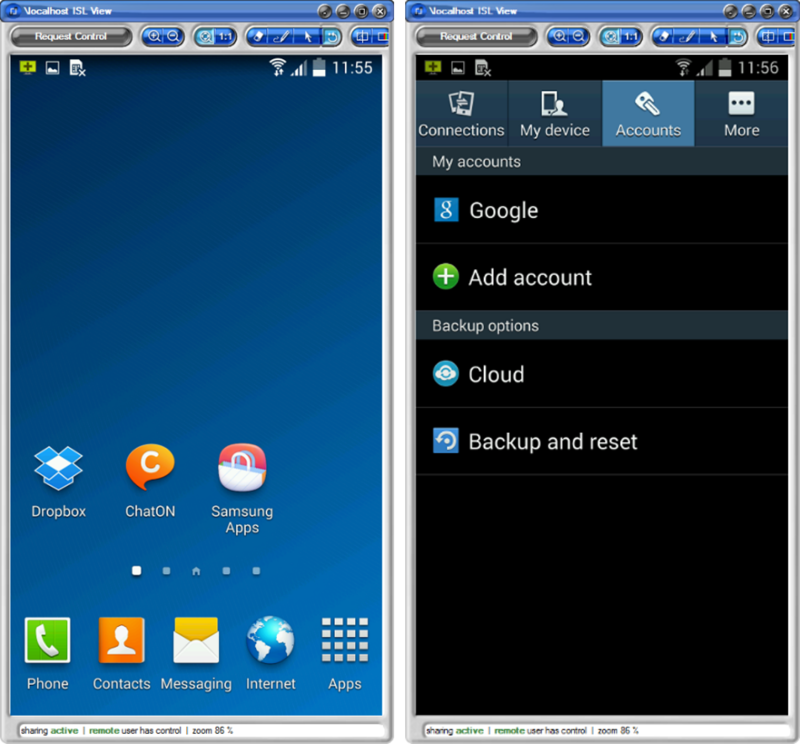 The ISL Light Remote Desktop app is free and available on Google Play. To be able to receive tech support, the mobile user downloads the ISL Light app from Google Play and opens it. Then he/she types in a session code provided by the supporter to immediately connect to a remote control session. When the mobile user accepts a remote desktop sharing request, the supporter gains full control of the mobile device and can start troubleshooting it immediately. Faster results – happier clients. Additionally to having full remote control over Samsung mobile devices, ISL Light allows a view-only mode when connected to other Android devices facilitating relatively fast remote support through the easy-to-use remote screenshots. As it holds true for most support situations, it’s usually enough just to get a screenshot of what’s happening on the mobile device in order to resolve the issue and thus avoid possibly frustrating phone conversations. Android users connected through ISL Light can thus easily send a screenshot over to their operator by making a normal screenshot of the problem (Volume Down + Power Off on most devices). The screenshot then automatically appears on the supporter’s computer. The app continues to provide seamless remote access from Android mobile devices to remote computers. Mobile users can easily connect to any remote computer (Windows, Mac OS X, Linux) and either efficiently troubleshoot technical problems, or remotely access one or more unattended computers to monitor them, install updates, perform a periodical check-up and other maintenance tasks. 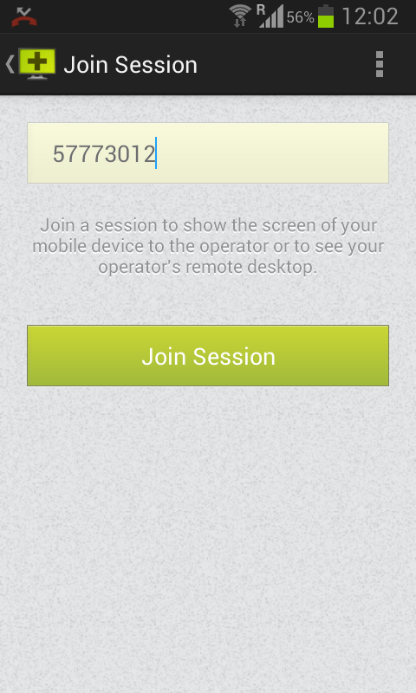 You are welcome to download the new ISL Light Remote Desktop app from Google Play for free. Let us know in the comments if you like it. This entry was posted in Android, ISL Light, isl online, IT support, Mobile, remote desktop, remote desktop support, remote mobile control, Remote support, Uncategorized and tagged android mobile devices, business remote support, control a remote android, mobile remote support, remote desktop app, remote support for android. Bookmark the permalink.